This article aims to push the discussion further, looking for causes that might explain this effect based on observations from working in a Chinese shadow bank. The overall argument is: It is because the economy is floundering, that the stockmarket is rising. This sounds counterintuitive to most economic rationale, but analysed in the context of China’s tightly controlled financial and economic systems, it’s plausible. Clear as day, the market is moving in the opposite direction to the economy, but as explained later, there could be a logical reason behind this. The headlines and comments help reinforce overseas stereotypes of the Chinese economy (and Chinese investors) behaving irrationally, being driven by ‘animal spirits’, a term first coined by Keynes, whereby behavior is driven by “optimism rather than mathematical expectations”. It is also a phrase used by analysts, when unable to find a logical explanation for a turn of events. 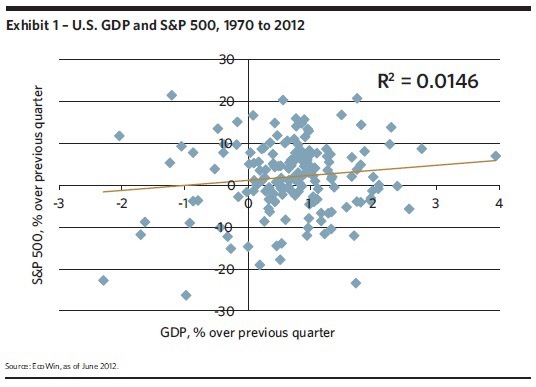 This counterintuitive research paper from BNY Mellon Asset Management shows in the below chart that “Over longer time periods, the statistical correlation between the quarterly change of real U.S. GDP and the S&P 500 is virtually zero (Exhibit 1)”. The main reason being “Stock prices generally reflect investor expectations for future corporate earnings and consequently for future economic growth”. Since then mainstream media have started covering China’s ‘dama’, a Chinese term which Zerohedge likes to translate as ‘Chinese housewives’. China Economic Review politely informs us that “China’s retail investors don’t care what you think about their stock market”, writing a nice piece explaining how the ‘dama’ take cues and read the tea leaves of Chinese government policy. But all the ‘dama’ in the world is not enough to move the market alone. In contrast to China’s last bull run 2005-2007, Chinese investors across the spectrum have been carried along the way by margin lending, tripling, or in some cases quintupling their purchase power. 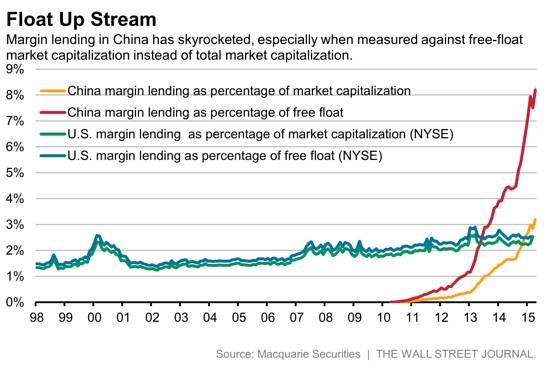 As the Wall Street Journal (WSJ) shows with a useful graph, “China’s epic stock market rally has been fueled by an even more epic amount of margin lending”, highlighting “…as average free float of Chinese stocks is around 40%…adjust the numbers, and China’s margin lending has gone “parabolic” as Macquarie puts it.” So that’s: (epic x 2) + parabolic = extreme! The key factor making share prices rise so quickly does not concern the retail investors, who are just the public manifestation of the bull run, and derided in local and foreign press as dumb investors, but rather the money backing them. 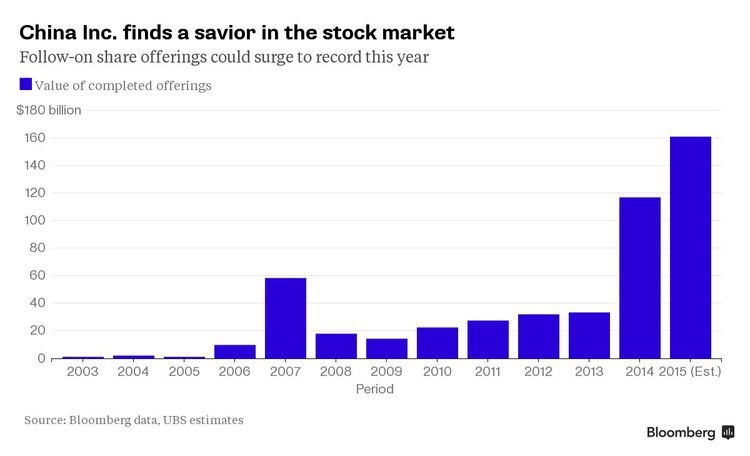 For every 1 yuan placed down by a retail investor, up to 5 yuan is matched by a financial institution. The Economist notes “The outstanding volume for share financing has more than doubled over the past year to more than 2 trillion yuan, or about 3% of GDP.” Recent moves by the regulator to curb stock brokers margin lending, only shifts the funds via shadow banking channels. The minimum 500k threshold set by brokers is easily circumvented. One local broker explained to me, I only need to place 500k of funds when opening the account, place one trade, then can shift the funds back out again. Don’t have 500k sitting in your bank account, then raise a short term loan via an intermediary that specialises in this business. But that is just the official margin lending that can be recorded at the China Securities Regulatory Commission (CSRC). In addition, the shadow margin lending pumped through umbrella trusts, first to be explained in English by chiecon late last year. Whilst Chinese media estimated umbrella trust funds at around 200bn yuan late last year, industry insiders indicate this has expanded at similar rates to official margin lending, and is more likely now over 1 trillion yuan. Why? Because punters are attracted to shadow margin lending due to the higher leverage and wider choice of stocks available. As for the recent CSRC and China Banking Regulatory Commission (CBRC) curbs on margin lending via umbrella trusts, and reports in Chines media of curbs on the HOMS trading system, there are new runarounds in place, although not under the scope of this article. The point missed by most foreign media reports, and one domestic media is perhaps not allowed to state explicitly, is that because the economy is slowing down, funds are being diverted elsewhere chasing high returns. 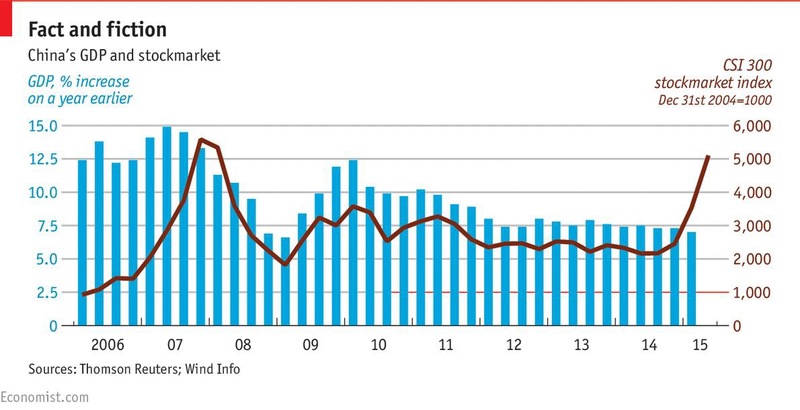 Chinese investors have traditionally had very limited investment options. Until the opening up and reform in the 1980s, there was no capital to invest. Then since the 2000s, the only major asset one could buy was property. But now that option is no longer on the table. In short, the source of funds hitting the stock market is not just from stockbrokers, but from everywhere, multiplied with leverage from state entities. 1. Banks – Due to economic restructuring, which involves limiting lending to excess capacity industries (including real-estate), falling interest rates, unwilling (or unable) to lend to private enterprise, but still carrying excess funds from PBC targeted easing policies, banks need somewhere to park their cash. Not allowed to invest directly in the stockmarket, banks can instead lend large amounts to trusts, enjoy preferential subscription status, and receive a fixed rate of return. 2. Trusts – Relates to the aforementioned umbrella trusts plus related products. 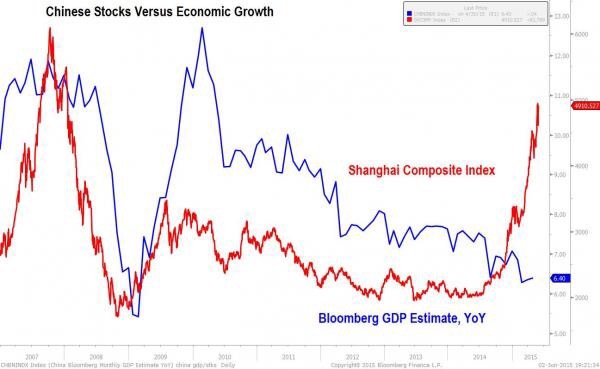 Back in March Zerohedge readers are informed that “nobody has been able to figure out just who is responsible for all this buying” and ‘reveals’ the “mystery buyer of Chinese stocks”, four months after it is was reported on this website. Following Chinese media reports in December on China Trust Association data, a forecast update by the Economist Intelligence Unit (EIU) in February noted this trend, and the consequent decline in total social financing (TSF), later reported by Reuters in March. These funds are raised from retail investors, who were previously buying wealth management products (WMPs) for investment in the property related projects. Yet it is important to note, these funds are often leveraged, again by matching with cash (in effect short term credit lines) from the banks. 3. SOEs – As reported previously on chiecon, SOEs are still the major recipients from bank lending, and government subsidies. But with declining production and orders, one method to generate returns, and minimise downsizing and lay-offs, is to place the funds in the stock market, via trust funds or asset management companies. 4. Real-estate developers – Ah yes, falling property prices, and no-one (even ‘dama’) willing to lend to property developers, unless you trick them by fronting as a P2P platform (recently reported by chiecon). Well if you can’t beat them, join them. Instead of using property portfolios as collateral to build more property under the old model, developers are now using land and property as collateral for investing in the stock market. If you are based in China, have you noticed a lot of silent construction sites recently? Even ok projects with half-finished buildings suddenly paused, as the owners divert funds into the market, waiting for property prices to pick up later. 5. Exporters – Whether as part of economic restructuring, or more probably due to China’s cooling economy, exports are relatively flat. In a similar fashion to the SOEs, many exporters and trading firms will have unused credit lines with the banks, which can be used instead to invest in the stockmarket. But if these SOEs and firms are unwilling to burden the high-risk of equity investment, they can mimic the banks, by providing the funds to trust firms, helping investors to leverage further. The result is interest rate arbitrage, with controlled risk. 6. PLCs – Firms already floated on the market! The recent sharp increase in share prices has seen listed companies asset values increase, which means their own shares can be pledged as collateral for loans from the banks. The May plummet in Hanergy’s share price brought to public attention a practice that is already been executed by listed firms, and covered by Bloomberg today. The problem is, these loans and those mentioned above, are meant to be invested in projects, but can often be diverted into the stock market via shadow banks. 7. Shadow banks – Often portrayed as the villain by Western media, these non-bank financial institutions are merely conduits, helping match state bank’s leverage with pooled retail client funds. Thus shadow banks are helping create markets, and have played an important role in sustaining the bull run, as they helped sustain weak industries and property over the past few years. In the case of margin lending to the stock market, they are in effect interest arbitragers, carrying minimal risk on their own books. All reports now cite Beijing’s desire for a ‘slow-bull’, but few enlighten readers on the underlying reasons: Short term it appears to be deleverage, and long term, potentially paving the way for privatisation. China’s rising debt has been well documented over the past few years, and provided the new administration with an economic headache. The policy tools to tackle this problem can loosely be summarised under ‘Likonomics’, a detailed translation of which can be found in an earlier chiecon post. Broadly speaking, the theme is to deleverage the economy, whilst maintaining economic growth. One solution is encourage more corporate bond issuance, and the local government debt for bonds swap program. Another solution, is equity fundraising. This enables firms to raise funds more cheaply, and is effective, as long as the stockmarket remains buoyant. Hence the government’s loosening of IPO restrictions, and other activities mentioned earlier, to attract investors back to the stockmarket. Chinese media raised this early on in the bull run, with Bloomberg later reporting the same in April. However there is also another aspect of reform, mentioned in the 2013 Third Plenum meeting, which provides an alternative reason for promoting equity fundraising. The Chinese government wishes to boost the formal role of capital, by encouraging private participation in public projects (see previous post on the PPP model), and eventually more private capital, to increase SOE efficiency. Despite calls from some Chinese economists, this is unlikely to be privatisation in the Western sense, as politically it would be difficult to push through, but rather privatisation ‘with Chinese characteristics’. This reform is still in early development stages, and dependent on reform in China’s legal system. But regardless of how privatisation is implemented, the fact remains that the Chinese government, with its majority stakes in SOEs, would be the biggest beneficiary of equity fundraising in a rising stockmarket. This might explain the Chinese government’s constant message of a ‘slow bull run’. Too quick, and investors get burnt in crashes, too scared to return (similar to in 2007). Too quick, and SOEs are still not ready with their restructuring plans, to cash in on the high equity valuations. Given the weak link with fundamentals, naturally external risks to this stockmarket bubble are high, especially any drying up of liquidity. Yet another risk which is not reported is ironically if the property market were to rebound or economic growth speed up again, funds would be drawn out of the stock market, and back into the real economy. For example every time national statistics this year have shown further deterioration in the economy, there is generally a positive reaction from the market. Most commentary mentions this is due to an increase in expectations for near-term interest rate cuts. Or maybe it is because investors are content that in the short term at least, there are no other investment distractions. *N.B. Only after publication of this article was it it noticed that during the same week this article was published, Bloomberg and Quartz offered similar explanations, perhaps based off similar mainland market information. However this article implies that the aforementioned arguments are the only plausible reasons to explain the divergence, and is the only article to highlight the wide range of alternative liquidity sources. Next Can west China’s GDP per capita catch up with the east coast in the next decade?